1. Peler la tête d'ail et tailler chaque gousse d'ail en rondelles. 2. 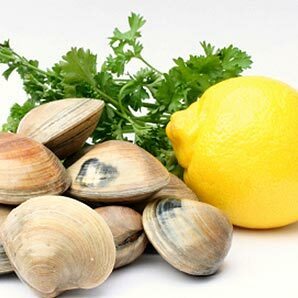 Clean shellfish in running water. 3. Thinly slice the peppers. 4. Heat olive oil in a frying pan, add garlic and brown slightly. 5. Add shellfish, white wine, thyme, marjoram, bay leaves and thinly sliced peppers. 7. In a frying pan, sear scallops and calamari. 8. Chop parsley or keep it in leaves for decoration. 9. When shellfish open, begin to decorate your deep dish. 10. Place shellfish in and add seared scallops and calamari. Pour cooking juice over and finish by decorating with parsley.